In times when fuel poverty and energy efficient building technology have become major issues, finding ways to save energy and reduce carbon emissions have become an increasing concern. That is why the development of eco-friendly technologies like the use of double glazing windows or cavity wall insulation have drastically increased. These technologies are both designed to save energy by keeping the heat inside the building; thus improving the house’s overall insulation. Each double glazing window is made of two panels of low emission glass that are covered with a thin coat of metal that reflects thermal radiation and inhibits emissions, because the air space that is located between both glass panels keeps the heat from the sun is kept inside the building. This effect is known as the solar gain. Some types of double glazed windows can reduce heat loss by up to 90%, which means that less heat escapes from, thus generating considerable energy savings. Furthermore the use of double glazing can also hugely decrease carbon emissions because the heat is kept inside the house, and there is therefore less of a need to heat the building for long periods of time. 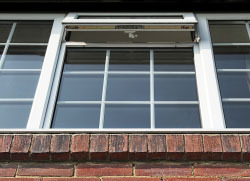 Double glazing is often the first step towards a well insulated home. However combining several energy efficient materials can make a home even more eco-friendly. Cavity wall insulation consists in filling the wall’s air spaces with a porous material like rock wool or glass fibre wool. This traps the air within the cavity and reduces the amount of heat lost by the convection off the wall by 35%. Combining double glazed windows and cavity wall insulation will most definitely contribute to lowering a house’s energy consumption because it will not be as necessary to use central heating as often.